Irrespective of the organization, we all struggle with transformational innovation. So often we are simply comfortable in our ‘business as usual’. We gear performance to the short-term, we put the emphasis on the current fiscal year, and we support the core business in numerous ways, usually with lots and lots of incremental innovation, so the results are realizable in this year. We are sometimes comfortable or confident enough to move into adjacent areas, to expand and feed off the core but these are less than transformational in most cases. 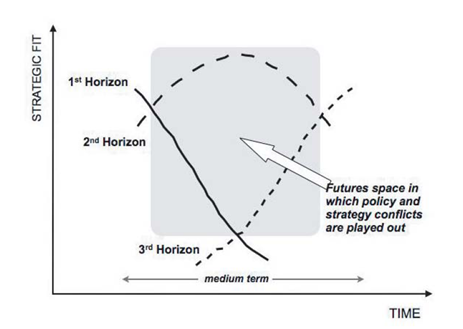 This space is the one we are the most comfortable to work within, this is the horizon one of the three horizon model approach outlined to manage innovation across a more balanced portfolio of investment. 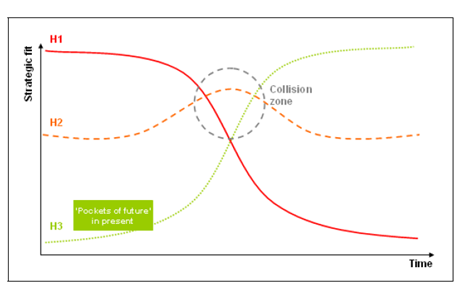 In summary, the three horizon model for innovation is actually a reasonably simple idea: with Horizon One (h1) being the current business focus, Horizon Two (h2) being more the related emerging business opportunities and Horizon Three (h3) being those that are moving towards a completely new business that can have the potential to disrupt the existing one. The complexity lies underneath this simple idea, you need to manage these different horizons with completely different mindsets. You need clear well-structured ways to extract the real return from managing a comprehensive innovation portfolio based on knowledge, experience, intelligence but exploring plenty of the unknowns about the future and openness to get you there, as ready as you can be . Its necessary today. Within our ‘business as usual’ attitudes lies the seeds of destruction. Today there is a relentless pace; we are facing stagnation in many maturing markets. We place a disproportionately high amount of our resources here to defend what we have and what we know; we actually subvert the future to prolong the life of the existing. We constantly look to make it more efficient and more effective but this is in the majority of cases just incremental in what we do, both in innovation and our activities. These are often simply propping up the past success instead of shifting the resources into the investments of the future. This is why the three horizon approach has real sustaining value because if we don’t have this longer-term, transformational perspective we are just prolonging the existing until it gets disrupted by others. This is where the working across different horizons for ‘thinking’ through innovation does need different tools and mindsets and these should be based on (h1) see and operate, (h2) adjust your thinking frame and solutions, (h3) more evolutionary. Each has different techniques to explore as I’ve previously outlined in my navigation guide to this approach. Clayton Christensen has written about this theory of disruption in his book “The Innovator’s Dilemma”. Professor Christensen then went on to write extensively on this and one further book “Seeing What’s Next” co-authored with Scott Anthony and Erik Roth develops this disruptive theory into how the future will unfold and how to make wiser choices on these insights. The three horizon connecting approach is an excellent methodology to use to help in managing these wiser choices. We do need this longer-term perspective and we do need to traverse into the future in clear thinking through steps (or horizons). Our horizon one does begin to decay faster today than ever, it does not fully cover off the strategic fit we want and can begin to lose its dominance over time. We need to manage this transition, not let others manage it for us. It is how we manage this transition becomes so critical. We need to exploit developing trends that are emerging (h2) and begin to tune into possible options in the future (h3). Within these options will emerge the winners and become the more dominant systems or solutions that we should be moving towards, even from today. Some of these only have faint emerging signals but they need to be brought into the innovation portfolio activity to explore, often in novel ways. The horizon two is beginning to address some of the current decay arising from the core within the existing activities (or system). Here we have the highest tension. The discussions that centre on often conflicting views of the future, compared to the existing realities and those providing the returns for today’s business. Often we can detect change but we consciously ignore it. This is the place where the disruptor’s are at work, existing or new competitors, working at displacing your products and market positions. They look to be more agile, they might have greater entrepreneurial ways, they are ready to explore emerging practices far more than the established leaders, they look to leverage different business models and are certainly not handicapped with legacy and mindsets stuck in the past. Increasing competition is today’s certainty. Horizon Two needs a totally different mindset. These horizon (h2) concepts being explored really do need ‘ring fencing,’ so you can protect these from all the ‘vested’ claims that your horizon one focus will continually demand to keep, so as to bring in the results in this calendar year. It is a real fight, these ideas or nascent concepts ‘give off’ negative results, they are still a mix of the tangible and intangibles where you can’t get the ‘hard’ fix on the ROI, on their real market value or potential. Many executives ‘defending’ the core will ‘attack’ or hold back any release of their resources to help these emerging initiatives. It is a ‘hard-nosed’ reality. It needs a very high level and conscious set of decisions coming from the top to determine these new moves. Do not believe that when most executives ‘just’ react and shrug their shoulders regarding h2 as a natural, everyday occurrence, it is far from not. Many have to come ‘kicking and screaming’ to supporting emerging activities. Far too much ‘invested’ interest comes into play. They see this more as a threat not an opportunity. It is not their sand box so why should they ‘play’. The tensions are not just visible but played out in many subversive ways. Just take performance metrics, if these are solely structured on the calendar year, are you realistically expecting a dilution of focus as their compensation is totally caught up in this. Horizon two poses a real challenge within any management of our organizations. If it provides current small bases of volume, no real meaningful profit from the investments made it can be a hard sell across the organization. Projects that focus on the future work mostly are based on ‘best’ assumptions. Sadly it is often executives expect to see the same ‘hard’ metrics being applied as the existing business. We ignore significant differences and this is a huge mistake. So you get these clear sense that many are sceptical or pay lip service to the products of the future as the thinking, judgement and value orientation are at such odds with the existing measures and metrics they apply to run today’s business and how they get judged. Often we then impose a set of metrics to compensate for this resistance. This new ‘push’ for establishing the rising stars ends up that most of the promising concepts never really cross the finish line of moving from ‘interesting’ to main stream. The core also starts to suffer from these multiple distractions and eventually ‘innovation’ gets a bad rap. Many promising ideas get starved or killed off from emotional reactions. The demand from supporting horizon two products or emerging concepts demands managements serious attention to getting resource allocation, response and focus into ‘actively’ managing this very real and tangible ‘innovators dilemma’. Managing the rising stars or future potential one is hard in existing structures. The concepts that emerge from horizon two will include the rising stars of the organization and will, over time, become even the new core business. These are a mixture of step-outs from today’s core, or extensions that have come from the adjacency work consciously being undertaken or are truly emerging as new activities that need new depth in capabilities and time to build. These all have the potential to shift the organizations revenue base and challenge today’s cash generators. These need careful ‘portfolio and resource’ allocation. These extend the organization from your existing into new competencies, new markets and new challenges. Just please don’t use the same measures or metrics when you mix H1 and H2, although there is a huge temptation because it is just simply easy. This is where you try out, experiment, explore. This is the transiting point (my space of transition) where you work through different dilemmas and paradoxes to shift the organisation through this horizon two to position it for the longer-term future. This horizon is a real point of disruption to be well-managed as you navigate from shifting resources from today’s core to that third horizon, the predicted future where ideas and proposals are still forming. Horizon two actually ‘claims’ more time and attention than on the surface it deserves but this is the wrong mindset, it simply needs too. This is not about supporting the ‘existing’, this is working actively on the ‘preferred’ as it is working to reduce current shortcomings, injecting new life and vigour into the present to offer a broader sustaining future. Horizon two investments should be challenging ‘business as usual’ and should contain many of the catalysts for renewal, for the future growth. It is renewing the ‘fitness for purpose’ through innovation taking you along different pathways to the long-term successors of your business. Horizon two can be a powerful catalyst. It can alter the way you are currently doing things, in new business models, in new systems, structures and delivery. It points you to a new, hopefully preferable future, worthwhile to pursue and attractive. It refreshes, it can invigorate and this horizon holds the keys and transition path to realizing that vision laid out in the ideas forming in horizon three. To battle the increasing pace of obsolescence, we need to not just see and operate in today’s world; we must look towards the future. We must break out of incremental steps alone in our innovation activities, they just don’t simply ‘cut the mustard’ any-more, they are simply not good enough, in our rapidly changing world where increased competition is appearing from anywhere. We need to build out new capabilities, capacities through new innovation competencies. We not only need to envision our future and the part we want to play within it but need a clear approach to working through the challenges and tensions to achieving a real balance in our innovation portfolio that work towards the same goal of being a material part of the business. That is managing innovation not just in today’s horizon (h1) but in traversing into the future with more breakthroughs (h2) and transformational innovation (h3) that is organized around the three horizon methodology. Making that essential traverse through horizon two is the toughest part. It needs carefully managing to have any really sustaining pathway to the emerging future. This entry was posted in Polymers and tagged Alignment of Strategy and Innovation, capabilities for innovation, conflicting innovation decisions, Innovating across different time frames, innovation pipeline management, innovation portfolio management, Mapping your resources for innovation, planning innovation execution, scanning the horizon, three horizon approach, three horizon framework, three horizons. Bookmark the permalink. Your article helped me a lot to pass my exam. Thank You!